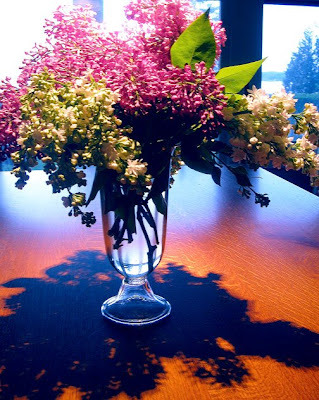 Vases brimming over with tight lilac blooms--fragrant and room consuming. The white and purple trees at the lake have lots of promise from now until Memorial Day with the cool weather we have had. Now, if we get a little 80 degree burst early on, then there is the oppty that the lilacs will burst sooner. But, to be honest, we are more likely to have it happen in it's own time.